I’ve tried to read the runes on the draws for the 2010 World Cup and Euro 2012 – with an almost freakish level of success. For 2010, I tipped England for Group C and suggested they’d be only too happy to be joined there by North Korea, Algeria and Slovenia. Swap North Korea for the United States and that’s exactly what happened. The idea was that England would stroll to top spot and take on the runner-up from South Africa’s group, rather than getting battered by an in-form Germany. For 2012 I tipped England to go into Group D with Ukraine, Sweden and Denmark. Again, right place with two out of three opponents correct – only France, instead of Denmark. This time it’s different. For one thing, groups will be played across Brazil – a decision that is rightly worrying Roy Hodgson. And as an unseeded team, they could be handed any on of 24 sets of fixtures, rather than the seven possibilities the top tier teams have on their plate. And as for making it ‘easy’ – well that’s where it gets hard. Clearly, among the seeds England would want to avoid Spain, Argentina, Germany and the hosts. What’s more, if England were drawn against the other South American teams, Uruguay or Colombia, they would not only be facing teams close to home territory but would also face an increased prospect of playing another team from the same European pot England sit in – a group that in its own way is as menacing as the seeds. That leaves Belgium and Switzerland. Belgium have tapped a rich stream of talent – would you prefer Vincent Kompany or Gary Cahill? Eden Hazard or Theo Walcott? Romelu Lukaku or Danny Welbeck? The Belgians are a team on the cusp of greatness, and a good bet to at least match the 1986 Enzo Scifo generation that made the semi-finals. Pretty much by default, that leaves the Swiss, the only seeds England would have any reason to be confident in facing. Such a turn of events greatly increases the possibility that England would face a South American team from Pot 2. Chile or Ecuador can’t be drawn against the four South American seeds. It’s probably too much to hope that England draw the weakest African qualifier, Algeria, again. And a fat lot of good it did them last time anyway. So let’s take Ecuador from that group – certainly not a bad side, but one England would back themselves against. Pot 3 is the weakest, but still contains plenty of teams you’d rather avoid. The USA and Australia are no mugs. Mexico struggled in qualifying, but may fancy the conditions, especially in northern Brazil. Japan and South Korea have been constantly improving. Iran and Costa Rica have solid tournament experience, Honduras less so, so we’ll take them. For the sake of argument, let’s stick England in the second slot in B2 – which gives them games largely in the more temperate south. One basic principle for the draw: Fifa will not want Brazil to struggle early on on home turf, so expect a fairly easy Group A as well. So the draw, largely random, could go something like this. So there you have it – if England were to win the group they would play the second team in Brazil’s group – and would Greece, Algeria or (more likely) Costa Rica really stop England getting to a quarter final, where they’d most likely to be playing the winner of Group D. Could England, on a good day, beat Belgium or the Netherlands? Probably, setting up a most unlikely semi-final. Which is, potentially, the worst possible outcome. England have fallen behind in player development. Not just behind Italy, Spain and Germany and other nations we fancifully compare ourselves to, but even the Belgiums of this world: smaller countries putting out substantially better teams. What might be better is a draw that sends England crashing out early with their tails between their legs. A draw that focuses the minds of our FA, clubs and leagues on developing quality English players. What’s more, there must be no excuses – it must look like a draw that England should at least have a chance of getting through; so for example putting England in slot four in Group G, sending them to the tropical heat of Manaus, Fortaleza and Recife while pairing them (say) with Argentina, the Netherlands and Mexico would be overkill – it would just fuel conspiracy theories and hard-luck stories. So, for the sake of argument we’ll give them the same group and the same set of fixture dates. And we’ll pair them with a European seed: Belgium. Then we’ll give them an African second seed, say Ivory Coast. And an English-speaking team from the third group: Australia. Three draws and out? Stranger things have happened. So, the best of them; The Mail and The Mirror both, in their very different ways, strike just the right tone for their readerships. Interestingly the Telegraph goes for the same pic as The Mail, but goes with the stark, word-free cover – clean, crisp and reflective of a world where newspapers set the tone rather than breaking the news. The Indy does likewise, with a starkly different front reflecting its starkly different readership. The Guardian‘s is similarly neat, with a smaller head, striking greyscale front and white-on-grey text. The Times has the best header tucked behind an eyecatching wraparound, but an underwhelming and low-key design on its ‘real’ front. The Socialist Worker? Ok, someone had to do it, but the Morning Star manages to put the boot in without being quite so crass. The Star and Express do a decent job, although the former could probably have done without those two massive plugs down the side of the splash? The worst? By a long way, The Sun. This was the paper Maggie’s working class supporters lived off yet all they can manage is a week, desperately alliterative head focusing on a deeply unimportant, boring and irrelevant part of the story, with a touch of tastelessness? With thanks to colleague George Chen on Twitter for forwarding the pics. From growing up in the North of England to living and working in Hong Kong, Margaret Thatcher’s long shadow looms large wherever I turn. I’m not going to add to the million and one words that will be spouted on her ‘legacy’, for Britain or Hong Kong. Suffice to say, one side will say she was wonderful, the other that she will be dreadful. Suffice to say, neither is entirely right or entirely wrong. I’m neither in mourning about her death nor celebrating it (except in the sense that we blackhearted journalists always celebrate big breaking news). What’s undoubtedly true is that I’d never have become as fascinated by politics as I am today if it hadn’t been for a towering figure like Maggie. I’m told that, on a visit to London at the age of three, I stood outside 10 Downing Street (must’ve been before the barriers – a grim legacy of the Thatcher era – were erected to keep out the hoi polloi and the IRA) and demanded to know ‘which bedroom is Mrs Thatcher’s’. I must’ve been six or seven before it became apparent that it was possible for a man to become prime minister, and probably a few years more to realise that it had once been the norm. 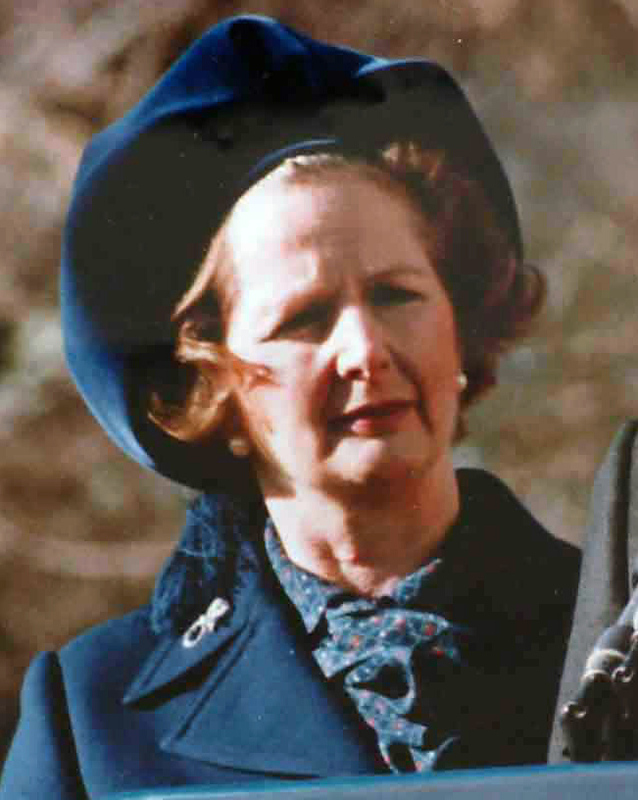 While nobody seemed to like her, Thatcher was inescapable. From wandering through the mud of Goose Green in her wellies to wandering, dazed, out of the bombed Grand Hotel in Brighton. Unforgettable was the day when my dad showed her round the showroom at his work – we kept for a long time the video from the local news in which he’s seen calling out ‘Mrs Thatcher’ as she ignores him and wanders off in the other direction. By 1987 it seemed unimaginable that that strange Mr Kinnock with his Welshness and ginger hair could possibly beat Maggie. I supported the Liberal-SDP Alliance at the time, due to the fact that A) My mum did and B) they had the same name as the Rebel Alliance, the goodies from Star Wars. But even I knew that Mr Steel and Dr Owen were never going to have to settle the question of which of them was going to be PM (it should’ve been Shirley Williams of course, as lovely when I met her at a pre-election rally that year as when I interviewed her as a young reporter 15 years on). What really turned me on to politics was the drama of Thatcher’s downfall. The possibility that the other big beast of the Tory jungle, Michael ‘Tarzan’ Heseltine had been bubbling in the background for some time. Then, one Sunday night in 1990, the Machiavellian plot ramped into full gear and we saw in the rawest sense the unfolding of a bloody battle for the keys to 10 Downing Street. This had nothing to do with Thatcher directly, of course. Rather it was the seminal television series House of Cards, which echoed and coincided with the ousting of Thatcher and the ascent of John Major, and with him a greyer, duller political world. Tony Blair followed, a media creation whom Thatcher would have eaten alive. Then Gordon Brown, who entertained the Iron Lady for lunch in the misguided hope that some of her popular appeal would rub off. Then David Cameron, the ultimate child of Thatcher. None of them seem larger than life in the way that Thatcher (or indeed some of her contemporaries on left, right and centre) did. Would Spitting Image have been a hit in the day of Brown? Will Cameron ever challenge Thatcher’s record of appearing in almost 100 Private Eye covers? Don’t hold your breath. Are they, a bit like the American cover version of House of Cards, no more than a pale imitation of a grander creation? You might well think that, but I couldn’t possibly comment. These Olympics have been brilliant. Absolutely brilliant. Even as a long-term sceptic on London as a choice of venue (largely a result of the metropolitan elite’s disdain for the Manchester 2000 bid) I can’t help but be impressed. But the Olympics are all about going one step better and striving for constant impression. And the fact that three of the five channels showing the Games in Hong Kong are broadcasting synchronised swimming at the moment certainly offers food for thought. NBCfail? Hong Kong should be so lucky. The telly here has been awful, probably because the deal to decide which free-to-air channel would broadcast the action was only decided a week or so before the opening ceremony. The bulk of the action is being shown on Cable TV, the broadcaster having bought the rights a few years ago in the misguided belief that it would have its own free channel by now. It’s got four channels showing the Games, but there’s no co-ordination with the two terrestrial channels sharing 200 hours of Games footage. 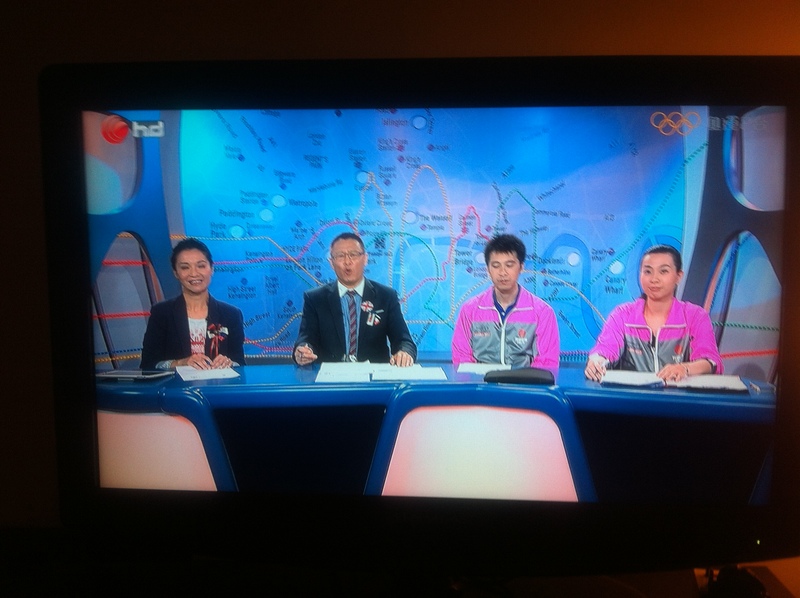 So when ATV switched away from the women’s road race to show a Chinese gymnast, ATV continued to show the gymnastics – on both its Cantonese and English language stations. Even with one channel needlessly devoted to socccerball, that left a spare channel for the road race, one of the blue riband events of the early part of cycling. But no, Cable TV stuck with whatever it had on and the tense finish was only shown some time later on ATV. A few modest suggestions to make the events go with a little more zip. Equestrian: Obviously the horses should get the medals – they do all the work. Also the dressage really does have to go. Charlie Brooker bluntly sums it up in the Grauniad as teaching a horse to mince like a 1970s sitcom homosexual. Am I the only one who is happier with the idea of horses risking life and limb doing what they do naturally over the Grand National course than doing something as obviously and humiliatingly alien to them as prancing about for our entertainment? I did consider national hunt racing as an alternative, or indeed flat racing, if only to give Hong Kong a chance of a medal, but they seemed a bit close to the cross country in the three-day eventing. Instead, in the interests of diversity, let’s replace dressage with buzkashi. Diving: Let’s get this straight. Anything that involves judges giving points for artistic merit is not a sport. See also – anything that involves wearing sequins. But diving is undoubtedly spectacular, so what it needs is a way of marking all that twisting and turning in a fair and quantitative way. Fortunately popular culture, in the form of the old video game Sonic the Hedgehog gives us a way. It may take a bit of jiggery pokery, but surely we could get afew gold rings flying, with points for every one they manage to touch? The same could work for the trampoline. But sorry gymnastics, there’s no hope for you. Cycling: OK, it’s pretty perfect. 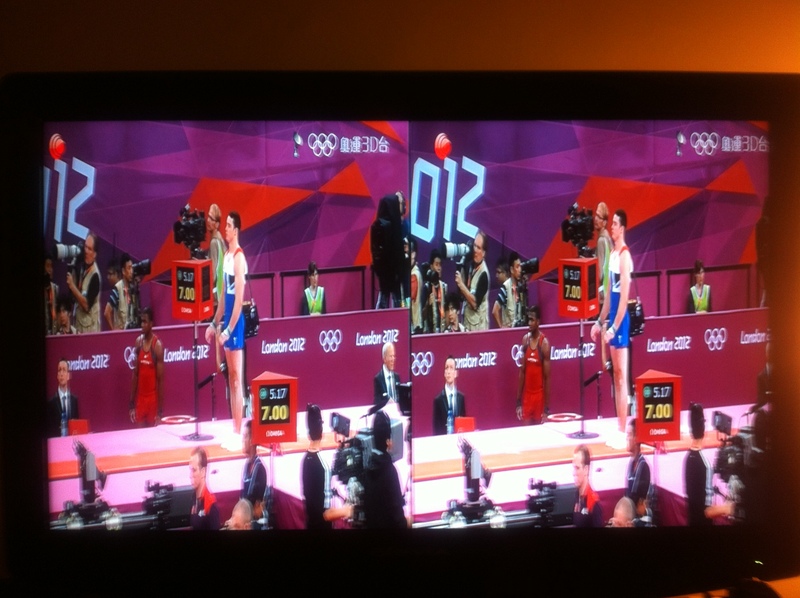 And perfectly pretty too (Victoria Pendleton? The lovely Laura Trott). But you’ve got a velodrome there – what’s the excuse for not including Rollerball. You could even borrow the motorbike from that guy who sets the pace in the keirin. And it could hardly be more confusing than the points race. Hold the darned thing in Hong Kong! The small seaside town of Sopot has has more than a few flags fly over it during its 1,000 year history. 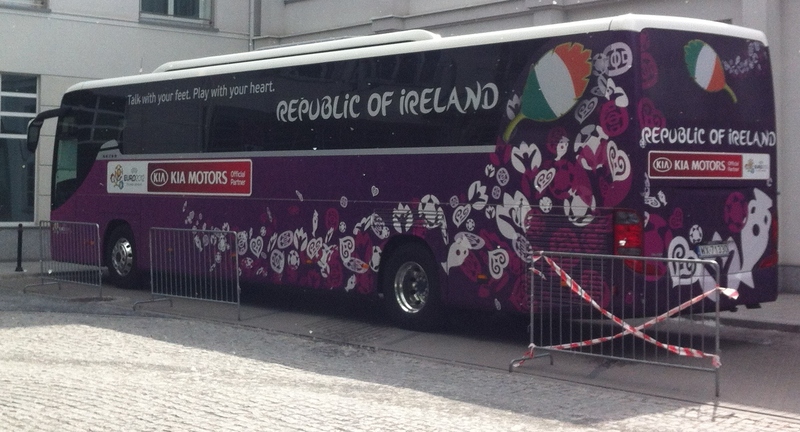 But it’s the Irish tricolor that dominates this week. 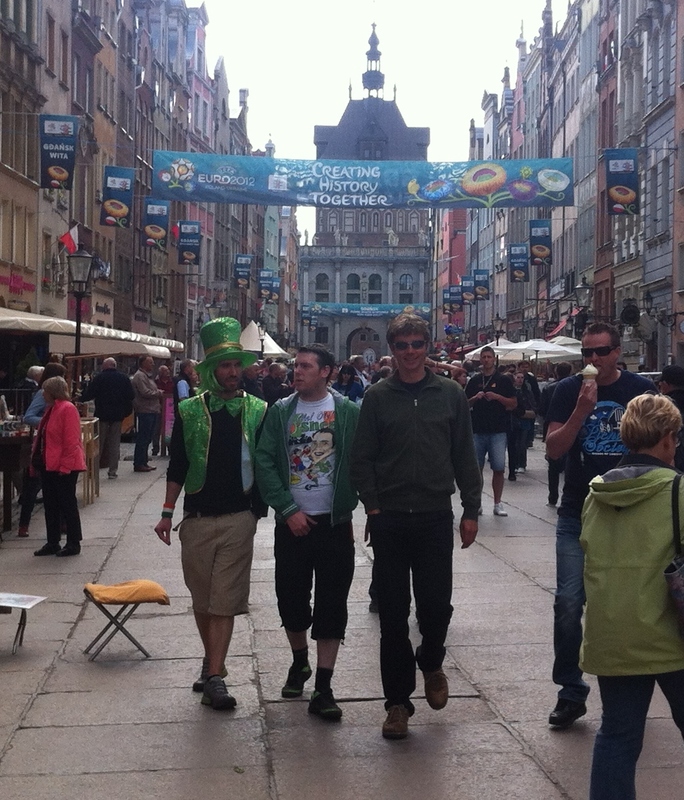 The town is not only the temporary home of the Irish national team, but also thousands of their fans, who aren’t letting the little matter of the football stop them from having a good time. As one Irishman put it, to one of the multitudes of television crews interviewing fans slumped outside the cafes along the famous Monte Cassino strip, “even getting to Poland is a victory for us”. Along with a few isolated groups of Spaniards, they’ve brought a big tournament atmosphere to the Baltic coast. The most common question I’ve been asked when I’ve told people I’m spending my summer holiday in Gdansk is “isn’t it a bit grim and industrial”. Well, yes … in a few spots. The shipyards still survive and there are plenty of dank, Soviet era apartment blocks scattered around. 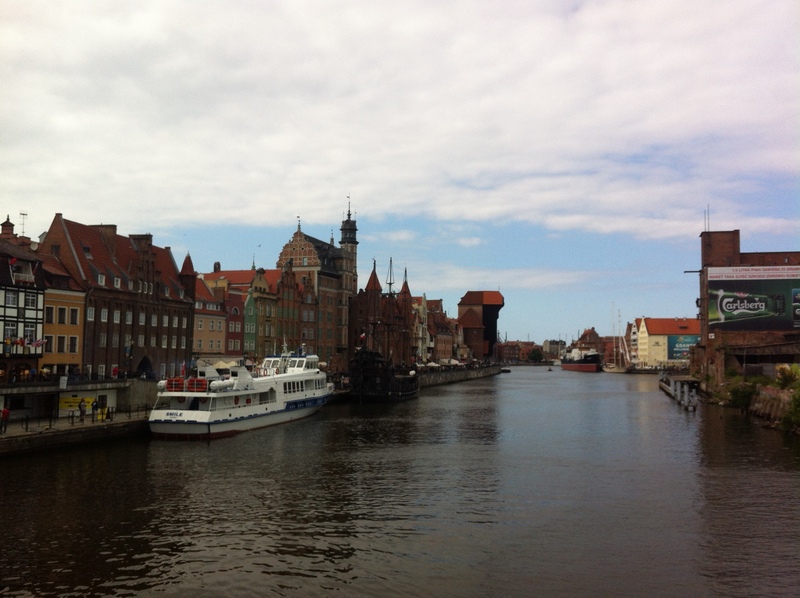 But the old town is a fine example of Hanseatic League architecture, and it was almost as packed with fans as Sopot – although the Irish made up only 50 per cent or so of the crowd, rather than the 95 per cent they represented a few kilometres down the coast. While it was a little chilly to be sitting outside, plenty did on streets lined with pavement bars and cafes, most with outdoor television screens to lap up the atmosphere. The city’s attractions also include the vast Church of St Mary, where thousands of Solidarity supporters sought sanctuary during Poland’s era of martial law in the early 1980s. While the shipyard cranes occasionally hover above one of the towering townhouses, it’s nothing more than a reminder that this is a living city, not just a monument to the past. 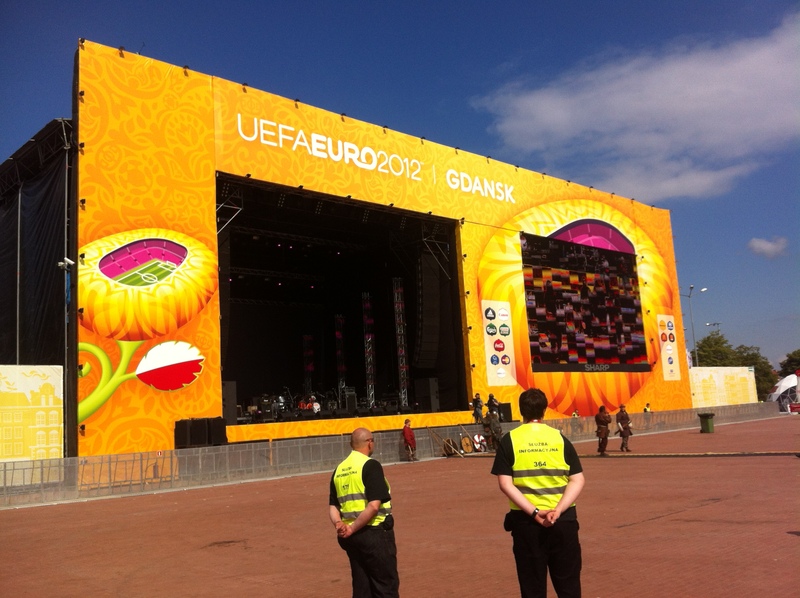 My dad and I lasted approximately 10 minutes at the ‘Fan park’ built between Gdansk’s main station and the stadium. It has a massive screen, space for 30,000 fans and a Noel Gallagher concert booked in for next week. But on the day we visited, a handful of people stood around drinking the overpriced beer of the sponsors, watching a recreation of medieval swordfighting (strange, as the acres of warning signs outside specifically precluded bringing in weaponry) played table football or crowded the merchandise stall, eager to use up the credit on the prepaid debit cards provided by another sponsor, the only ‘currency’ allowed in the zone. It may come alive during matches, but on a gameday afternoon, it was nothing more than a desolate temple to commercialism – and it didn’t help that the army of staff, who vastly outnumbered the fans, insisted on frisking everyone on entry. 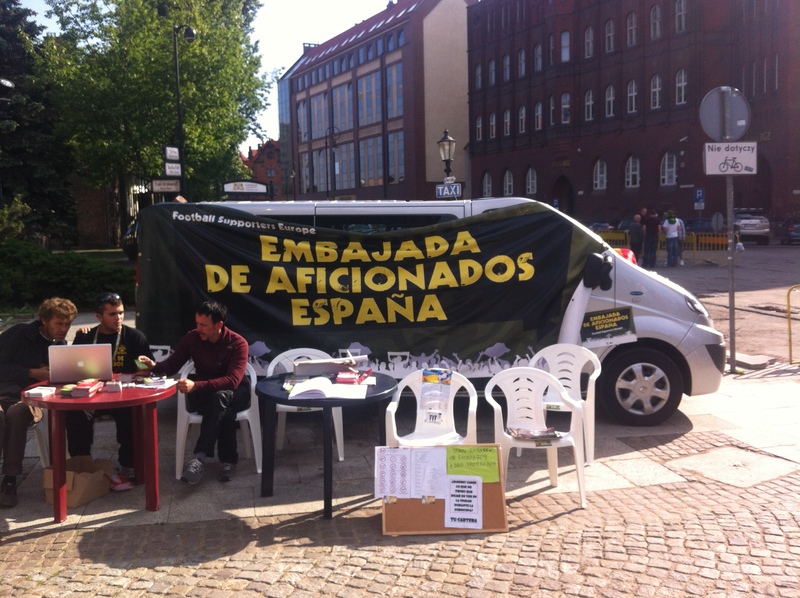 Far better was the fan embassy in the city centre. The atmosphere was more relaxed, with information points for supporters of the various national teams. The sponsors were in evidence again but at least this time one of them, the Dutch bank ING, was offering something useful – free lockers where supporters could leave their bags. A sponsor doing something useful and thoughtful to promote their brand? Let’s hope it catches on. And, frankly, it’s become a bit of a tourist trap. 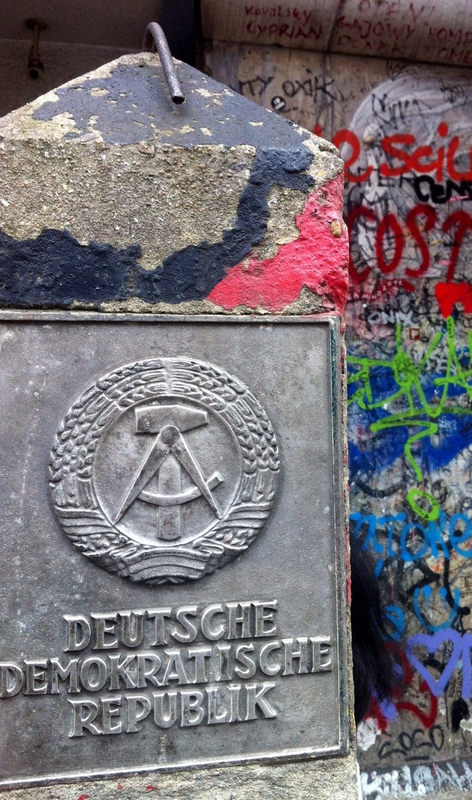 In fact probably Berlin’s most outrageous tourist trap. Guards gurn in vintage uniforms and offer ‘visa stamps’ and photographs – for a price, of course. 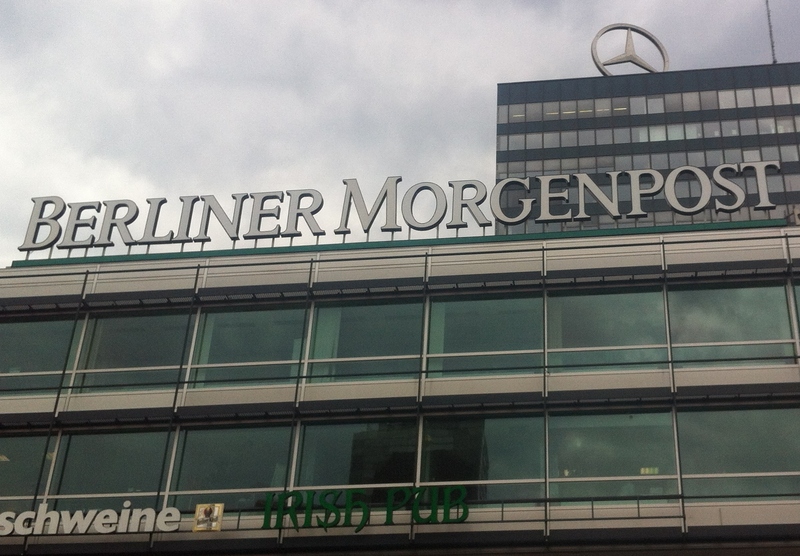 Every building within half a kilometre seemed to incorporate ‘checkpoint’ into its name somewhere – I lost count of the number of ‘Checkpoint Currywurst’ kiosks. Somewhat better was the adjacent Checkpoint Charlie museum – although at 12 euros a pop it was by some way the most expensive museum I saw. 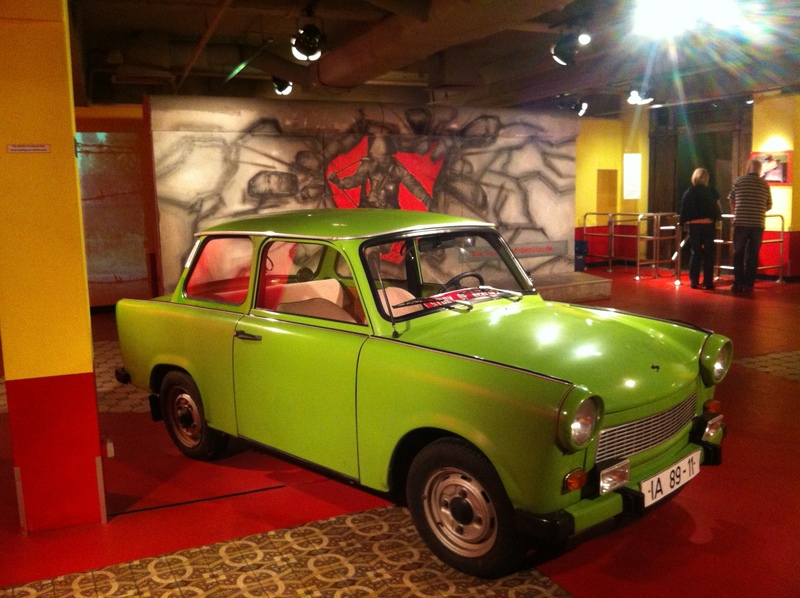 And while its collection of material relating to escape attempts and informative displays on wall life is impressive, the presence of a gallery devoted to a hagiography of German publisher Axel Springer and a vast display on the current and former role of Nato perhaps offers a clue to the fact that the excessive entrance fees aren’t the only place this private museum gets its funding from. There’s nothing wrong with that, and there was no sign of an agenda apart from a pointed dedication to freedom, a message that should resonate everywhere. But it does make you wonder what might have been left out. 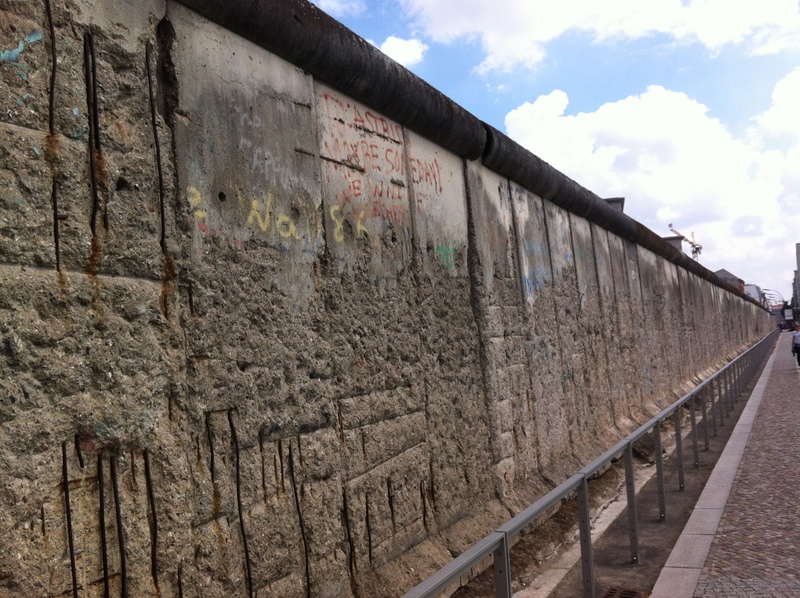 Better was the nearby Topography of Terror exhibition, set beneath one of the last remaining in-situ pieces of the Berlin Wall and on the site of the former gestapo headquarters. It sets out in detail how the Nazis came to power and the consequences. 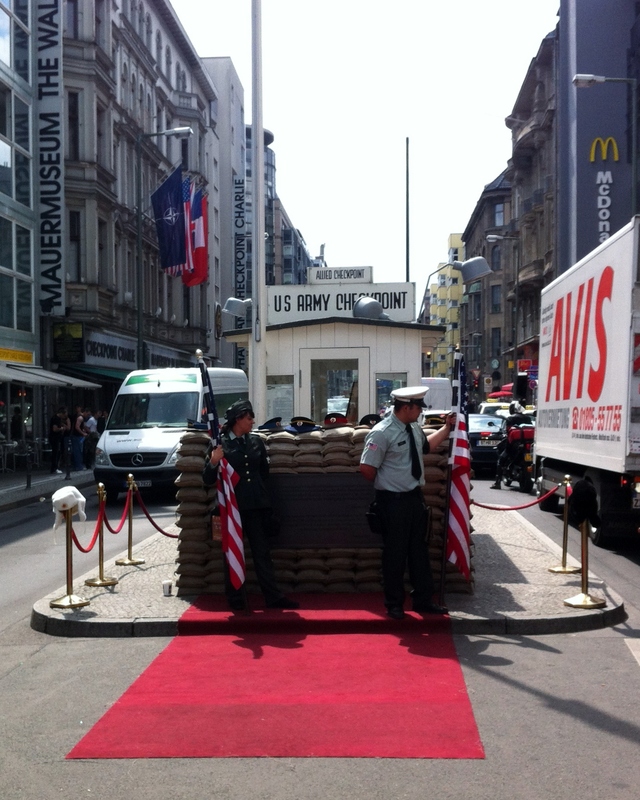 But … and this is one way in which the Checkpoint Charlie museum does better than many others in Berlin – the story is told in geopolitical terms. It would have been interesting to read, hear and see what ordinary Germans had to say about the rise to power of the Third Reich and its impact. It’s too easy to see that tragic era in terms of broad strokes of history – it should never be forgotten that millions or ordinary people, through stupidity, greed, desperation or … and this bit has contemporary resonance … disillusionment with what was on offer from the ‘old’ parties turned to the Nazis as a solution. 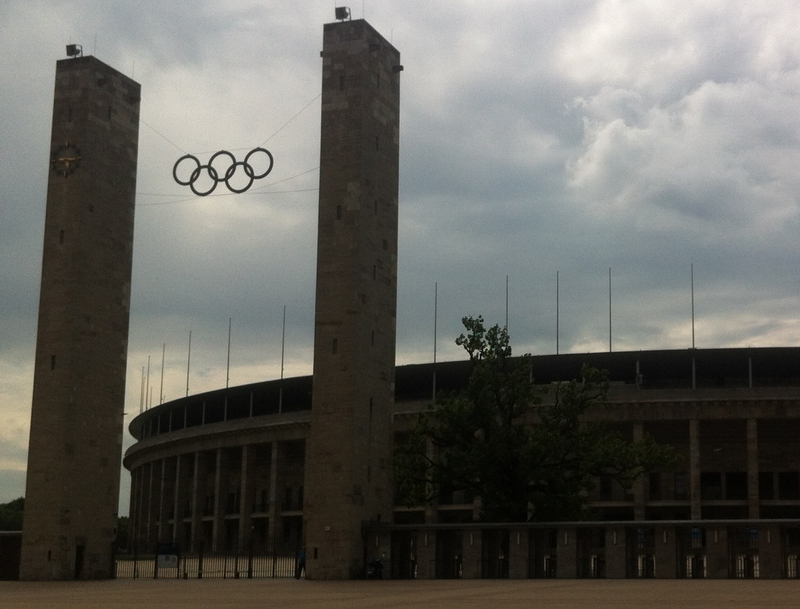 And another thing – Berlin’s Olympic Stadium was built in broadly the same era as London’s Wembley stadium. Why is it London’s iconic stadium had to be bulldozed to make way for a concrete bowl with all the character of a Tesco store, while Berlin could refit the stadium to host the World Cup final? The Czechs were well beaten by Russia but came back strongly against the Greeks, who rode their luck a bit to grab a draw with co-hosts Poland. While they retain an outside chance of going through, it looks like Greece will be leaving the Euros even before it leaves the euro. Euro 2012 isn’t exactly short of politically charged clashes – see also Netherlands against Germany last night – but they don’t come much stormier than Poland’s game with Russia. The street violence earlier in the day was sadly all too predictable, but the game itself was a cracker as the Poles played above themselves to get a draw that could so easily have been a victory. They now need to lift themselves and play as well again against the Czech to set up a potential quarter-final epic against the Germans. Which, happily, would be the game I’m going to a week on Friday! 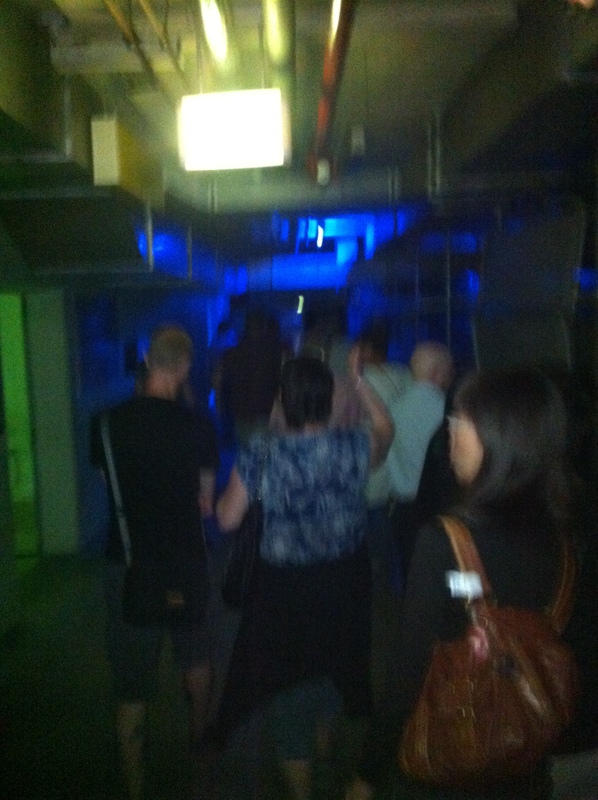 The day started – as any good day should – with a visit to a nuclear bunker. Not an inactive Cold War relic or an alternative seat of government, but a living, breathing nuclear bunker, yards from the shops of the city and ready to be pressed into service at a couple of week’s notice, cramming in 3,000 Berliners to survive the apocalypse. 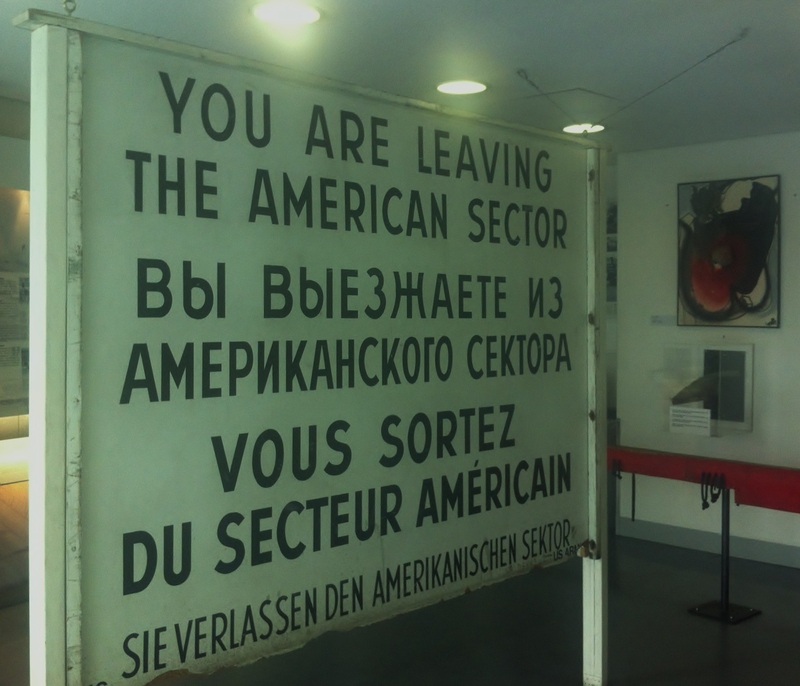 Tours of the bunker are a highlight of The Berlin Story, an excellent, interactive museum that, like so many of the city’s sites, takes an unflinching approach to the grim periods of Berlin’s past, through wartime, division and reunification. But it’s the bunker, built in the 1970s, that stands out. 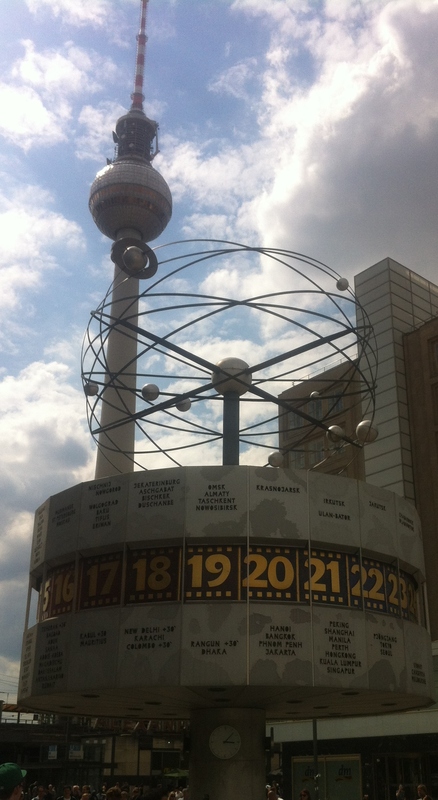 Around one per cent of Berlin’s inhabitants would have cowered in shelters like this in the event of a nuclear war – piling in on a first-come first-served basis and being expected to organise themselves – deciding how to divide the food and treat the sick. They would have stewed in temperatures of up to 35 degrees and 90 per cent humidity, surviving on 2.5 litres of water per person, per day for washing, cooking and eating. 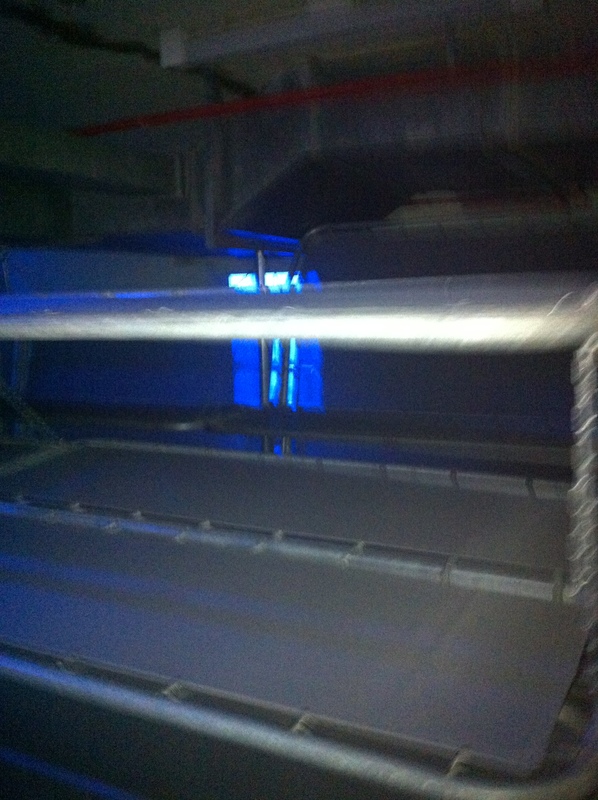 But worse was to come … after two weeks, the air filters would pack in and the survivors would be forced out into the streets above, with no plan for their existence thereafter and little chance of survival. So, a desperate group defending for two weeks with the prospect of certain elimination ahead … that brings us neatly to …. It started brightly enough, as it often does for England, with Joelon Lescott getting his unfeasibly large forehead on a corner to open the scoring. Fortunately the national hysteria was tempered nine minute later when Samir Nasri picked his spot far too easily, showing a level of technique few Englishmen could dream of. England need a rare victory against Sweden or a win over the hosts to progress. Perhaps two draws would do it, at a push. Neither possibility can be dismissed, but despite glimpses of promise from Oxlade-Chamberlain, there remain too many players in this England side who give the ball away far too easily. A good run in this competition will be no more than a sticking plaster – we continue to fall behind. I head east tomorrow, and at the moment the Ukraine look the more capable of the co-hosts to progress, thanks to Andrei Shevchenko scoring half as many goals in six minutes as he managed in his first 30 games for Chelsea. Should add that my thoughts on this game are a bit limited by the beers I had in the Irish Pub during the England game. Took me 20 minutes to realise the Sweden were the team in blue. The Irish Pub is well worth a visit, BTW. Guinness there is cheaper than in Hong Kong. Which, admittedly, isn’t saying much. 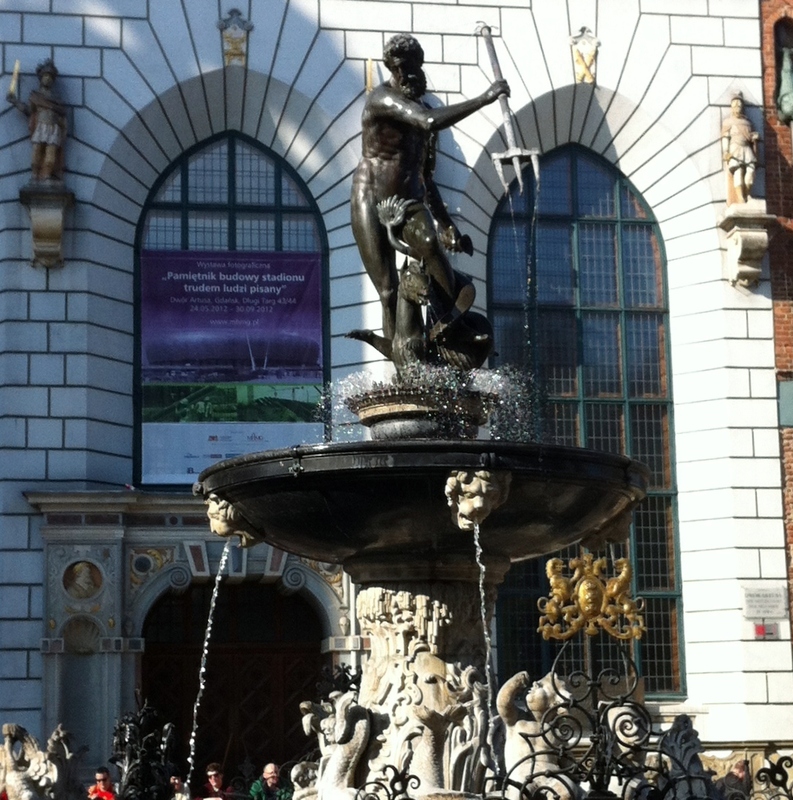 So forward to Gdansk! By way of an early departure from Berlin’s spectacular central station. As such, not sure when the next blog will be.